This is the time of year that hunters dress up in their camo and head to the woods in hopes of nabbing a big buck with a huge antler rack. So what happened to one hunter was completely unexpected. Maybe the deer in the video below just knew that the hunter wasn’t out looking for him, but instead was there hunting turkeys instead. 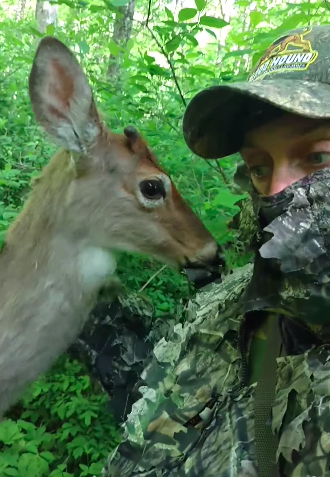 Whatever the reason, this deer got much more up close and personal than any hunter could ever expect. The turkey hunter in the video was out and about early one morning and had set up his turkey decoy when a deer wondered into the same are that the hunter was in. The hunter sat quietly and waited on the deer to pass, but the deer had other things in mind. Instead of wandering on by, the curious deer approached the decoy and the hunter. The deer gave each a sniff and a lick and even allowed the hunter to give it a few rubs on the head before finally heading on it’s way. I guess this little deer didn’t get the memo that men in camo aren’t usually there to just hang out. Check out the unbelievable video below and be sure to share it with your family and friends. It’s not every day that we get to see something like this up close.